The City of Bikes: Nowhere else in the world will you find a city that keeps itself so mobile and fit with the use of bicycles. They are everywhere you go. Not so much a commodity for the Amsterdammers, but instead a way of life. And as a visitor, using a bicycle is the perfect way to experience this beautiful capital city. Rent an OV-fiets from any train or metro station, and you can explore the many fun and cultural areas this lovely city has to offer. If you’re looking for a scenic break right in the heart of Amsterdam, we recommend a bike trip to Vondelpark. This enormous public park is a breath of fresh air in a bustling city, with lakes and green to be enjoyed by families and friends alike. It can make for a peaceful break from the busy roads and is perfect for an idyllic picnic when it’s good weather. Experience a cup of tea at De Blauwe Theehuis, or if you’re a film buff, the Film Museum offers an education on Dutch cinema. In the summer you can enjoy a wide range of shows and performances at the Openluchttheater (open-air theatre). The City of Bikes: There’s no question that the Netherlands offers some of the most beautiful gardens and fields in the world. So if you’re looking at replicating that beauty at home, cycle over to Amsterdam’s famous Flower Markets for your own bulbs to take with you. The flower market stallholders can help you pick the right tulips for your garden and they will also provide you with advice for the best way to treat your garden afterwards. Well worth a visit during your stay in Amsterdam. After all your cycling, you will no doubt be quenching of thirst, so why not rest at the beautiful Rembrandtplein. Packed with little cafes and restaurants, you will be spoiled for choice when it comes to finding somewhere to relax. There’s something for everyone, so enjoy a Heineken pilsje while watching the world go by. If you fancy doing a bit of wandering while in the area, we recommend visiting the Pathe Tuschinski, an extraordinarily designed cinema that regularly hosts Hollywood and national film premieres. You should always be vigilant while cycling through Amsterdam; you need to look out for automobiles, pedestrians, trams and other cyclists. Where possible, you should always still to the cycling paths. 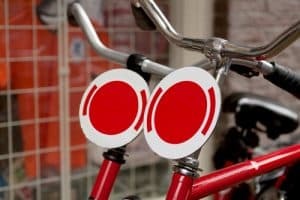 Also be aware that it is illegal to cycle at night without working lights so when you rent an OV-fiets, make sure that all the lights work, otherwise you could be faced with a hefty fine. Lastly, always secure your bike properly, as bike theft is very common. Just return your bike to the train or metro station you collected it from. Each bike costs only €3,85 for 24 hours which is a bargain. If you’re looking for amazing comfort at a great price, consider a stay at Hostel Sarphati Amsterdam. Centrally located, we always put your relaxation first. Book now to avoid disappointment.